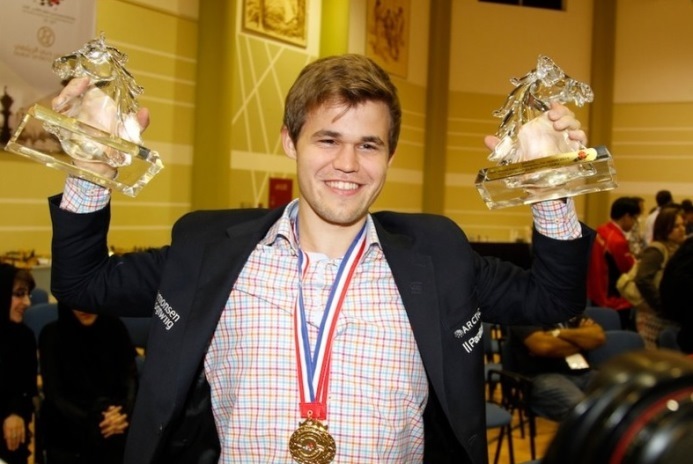 Magnus Carlsen is now a triple World Champion after adding the World Blitz Championship to his glittering array of titles. When he was asked where he can go from here he simply replied, “I can do it again”. 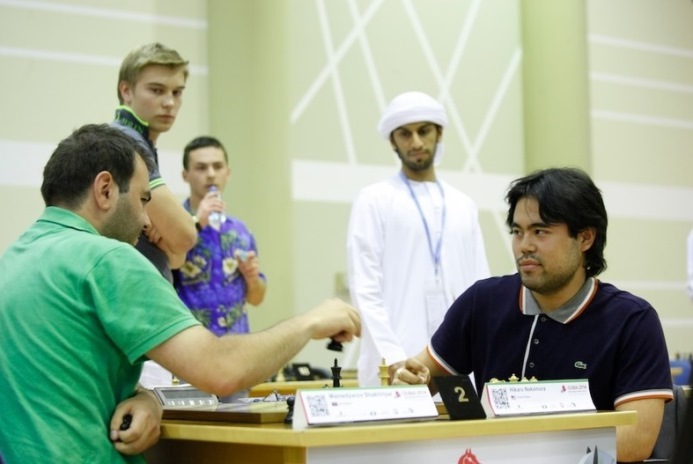 His victory in the blitz came despite fierce competition from Hikaru Nakamura (bronze) and Ian Nepomniachtchi (silver), with the latter leading with only three rounds to go. 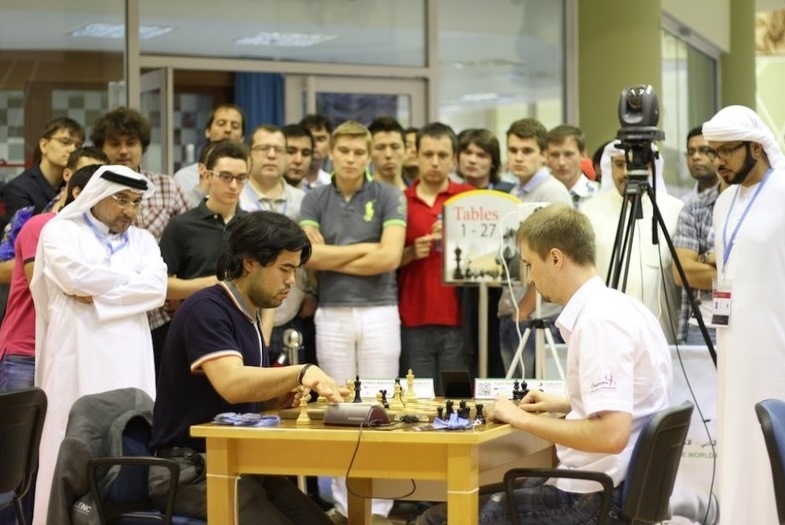 We look at some of the key storylines on a historic day for chess. It’s the third title I’ve gained here. I gained my grandmaster title here. It’s been great being back and obviously when you come here as no. 1 in the world you try to win. And since that worked out everything’s perfect. 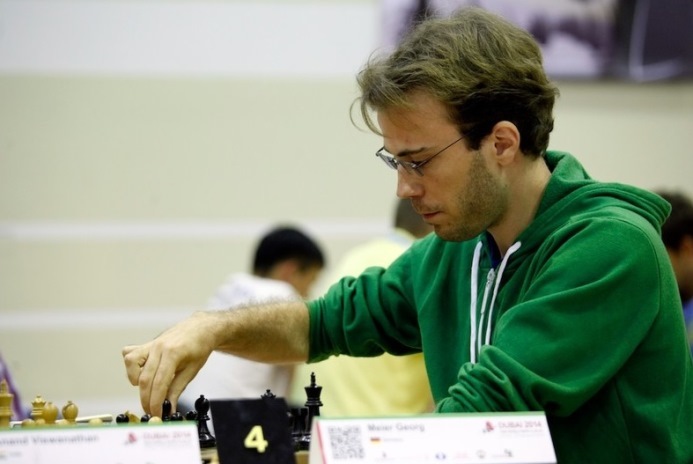 Georg Meier finished the first day of the Blitz Championship in second place, while 18-year-old Chinese player Lu Shanglei was in 5th after he won 7 of his first 8 games and stunned everyone by inflicting Magnus Carlsen’s only defeat of the whole event. Instead the German grandmaster's 34.Nh2? was against the spirit of the position and Carlsen soon penetrated on the queenside to claim the full point. 27.Rh6!! would have turned the tables, with Black forced onto the back foot since 27...gxh6 is impossible due to 28.Rxf7+ with check. Instead the immediate 27.Rxf7? hxg4 led to the first of three losses in a row for Lu Shanglei. There had to be at least one outsider making his mark on the second day, and this time it was little-known Russian Grandmaster Sergei Yudin, rated 2546 and world no. 470. A fantastic streak that started in Round 10 saw him score 6.5/7, with wins over Radjabov, Svidler, Wojtaszek and top seed Nakamura, to move into clear third place with five rounds to go! Here he needed to find a move like 29…Qd4 or 29…a4! to keep his advantage. Instead after 29…Rd8?? 30.Rc7! it dawned on Hikaru that the only way he could prevent a draw by repetition was to give up his queen. He then went on to push too hard and compromised his own position. Although Nakamura nearly hung on, after 111 moves Yudin had found a way to combine his queen and knight to score an unexpected point. That was the high-water mark for Yudin, however, who could only manage two draws in his final five games and had to settle for 12th place. Levon uncharacteristically blundered with 38…b5?? after which there was no way to save the d-pawn or the game. Nakamura of course played 42.Ne5+, picking up the exchange. One of the best things I learned from playing the World Blitz back in Moscow – a crazy event with maybe 40 rounds over two days – was that there are going to be streaks where you’re going to win a lot of games and then you’re just going to lose two or three games, so it’s more about minimising the swings than it is even about playing well. 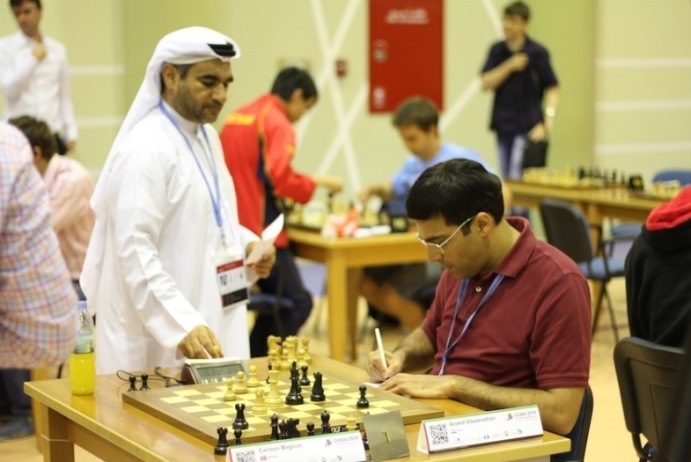 Despite last day losses to Nepomniachtchi, Nakamura and Le Quang Liem ex-World Champion Viswanathan Anand finished in a highly respectable 7th place to complete a strong performance in Dubai. What no doubt pleased him the most, though, was that his draw against Magnus in the blitz secured a 1.5:0.5 victory in their mini-match over both events. In each game Vishy had the black pieces, which should give him yet more encouragement before their rematch for the World Championship this November. I didn’t predict that Ian Nepomniachtchi was just going to crush the field... At that point it was certainly in his hands. In a wider perspective, however, it wasn’t so surprising. Although he's clearly underachieved Nepomniachtchi was born in the same year as Carlsen and had the edge over his Norwegian opponent in junior events. Indeed his classical score against Magnus is still 3 wins and 0 losses, while he also seems not to have lost a game in rapid or blitz events either. It’ll also probably be funny to hear, but I don’t see or feel his superiority even now. Yes, superiority in terms of results, in ratings, in the World Championship system. But overall superiority is proven in play. When you sit down at the board you have a chance to prove your superiority or, on the contrary, the lack of it. But as it is… Probably there are people who get very shy in front of players who have a high rating and title, but I’ve never had that, not even as a child. Nepomniachtchi is friends with and has worked as a second for Carlsen in the past, but his chances of overhauling Magnus to take the World Blitz Championship faded after letting a win slip against Korobov in Round 19 and then falling to defeat against Aronian in Round 20 (to emphasise the point Carlsen beat Korobov and drew two pawns down against Aronian). 31.Bb6! Qd7 32.Rxf6! Kxf6 33.Bd4+! followed with a decisive advantage. Magnus Carlsen could have taken his cue from Mario Balotelli and lifted his shirt to reveal a “Why always me?” message! 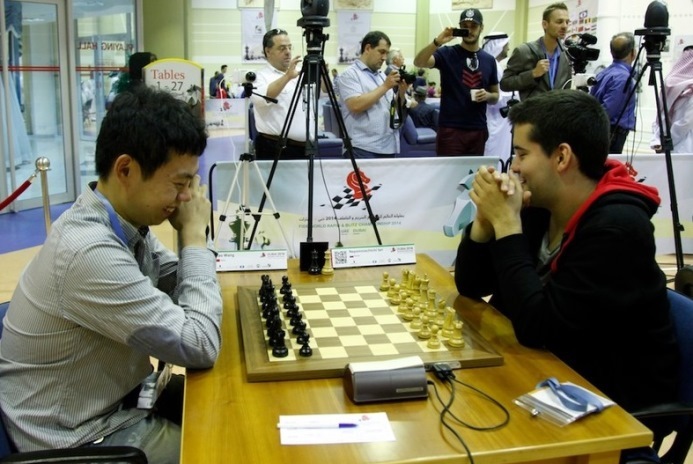 His victory in the World Blitz Championship was yet another example of supreme will-power and pragmatism. 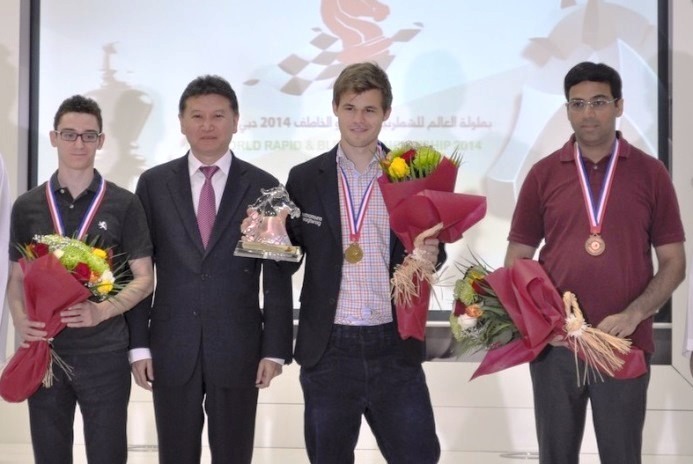 Despite ferocious competition and a bragging rights bounty on his head, Carlsen only suffered two losses in 36 games in Dubai. Aronian: 4 wins in a row (Carlsen drew, later commenting, “Obviously against Aronian I might well have lost, but I managed to defend that one”. It’s not rocket science. Part of the secret is just to play quick and make few blunders and you’ll go far… Obviously against [his second] Fressinet on the first day I had a special little recipe for him, but apart from that I was trying to play my kind of chess, just quick more or less healthy play and keep on fighting to the end. I think the others who played well did much the same. Ian maybe played even faster but more for tricks than I did. I don’t have the patience to play correspondence and I don’t have the quick hands to play bullet. Then I guess the decisive moment was the third to last round against Mamedov, because I had a difficult position and was under pressure and then at some point I set him a trap which, if I may say so, was pretty cunning, and he fell for it. Then I was in the lead. Knowing that Ian had already played a draw I believed I could make it and then the last two games went quite easily for me while Ian failed against Aronian. 28. ♗h3! was the winning move. After 28... ♘f3+ 29. ♖xf3 ♕xf3 30. hxg5 White wins. A check is coming on d4, so the only move is 30... ♖xf4 but after 31. gxf4 ♕xf4+ 32. ♕xf4 ♖xf4 the ending is lost, since after 33. ♔g3 the d6-pawn falls and Black is two pawns down. 28... ♕xg5 29. ♗h3 ♖h6! Pinning the bishop and also setting a trap that Mamedov falls into. 32... ♕xd1 and White is left with nothing. 33. ♕a8 ♘g4+ 34. ♔g2 ♕e2+ 35. ♔g1 ♕h2+ A crucial victory, after which Magnus eased his way to victory. That appeared to be little more than a blunder, though, since 22.exf4 couldn’t be met by 22...Qxf4 due to a knight fork on e6. After 22...Qf6 some caution was still required, but the result was never in doubt. Magnus Carlsen therefore claimed the World Blitz Championship by half a point, pushing his blitz rating to a stratospheric 2948 in the process. I’m still young - I’ve only done this once. I just want to keep on getting better and keep on learning. There are always things to improve upon, both in slow and faster time controls.